Embodying the adventurous spirit of its namesake explorer, Marco Polo Hotels across the globe have long been home to many world visitors. Located in the bustling commercial business district bordered by Mandaluyong, Pasig, and Quezon City, Marco Polo Ortigas Manila showcases the same renowned hospitality in contemporary design, curated services, and top amenities. With a passion for travel in its heritage and a love for local culture, the best of Asian traditions merges with western culture to make luxurious stays possible without ever compromising on comfort. This five-star hotel exudes elegance and warmth. From state-ofthe- art facilities to sophisticated suites, every experience has been designed for excellence. Marco Polo Ortigas Manila’s distinctive restaurants contribute to the metropolis’ diverse dining destinations. Culinary adventures await in the hotel’s signature bars and cafes. Each is symbolic of a trip to another part of the globe scattered throughout this beautiful high-rise. Café Pronto on the ground floor is a Mecca for coffee lovers. Casual and chic, the vibrant space houses a variety of pastries, breads, and savouries, like handmade gourmet sandwiches. Freshly baked scones are paired with sweet jam and a vast selection of flavourful teas, like the refreshing Earl Grape Iced Tea. Indulge in decadent cakes and sweets with a side order of the signature Silk Road Iced Coffee topped with marshmallows and meringue. 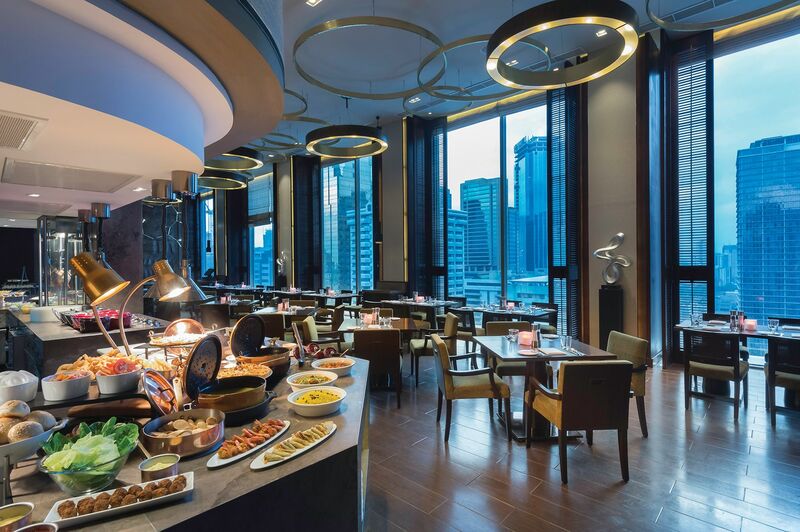 As a hotel that defies convention, its lobby is fittingly situated on the 24th floor and right beside it, an interactive kitchen and buffet concept that experiments with a plethora of cuisines. At Cucina, the hotel’s all-day dining hub, flavours cater to every discerning palate in a variety of stations which serve seasonal delights. Interiors designed by Filipino artist Jinggoy Buensuceso and floor-to-ceiling windows that open up to a charming city view illustrate a fusion of local and international. The 44th floor opens onto a feast of dimsum and freshly caught seafood cooked in deliciously traditional ways. Lung Hin transports diners to Hong Kong, presenting authentic dishes with contemporary flair. From the house favourite sautéed beef cubes with duck liver to the threeflavoured- prawns in salted egg, sakura sauce, and blueberry, the restaurant’s chefs create to excite the senses. With sleek interiors and an unparalleled view, Lung Hin redefines Chinese dining in Metro Manila. Perched on the hotel’s 45th and topmost level is Vu’s Sky Bar and Lounge. Here, guests cap off the evening with a vast selection of signature cocktails, like the Sapphire Road and mouthwatering wines and spirits. The creative hub jives to a different set of performers each night as the mood shifts and the hotel lights up the urban skyline.